The high levels of blood glucose (sometimes as high as 8 to 10 times the normal level in severe untreated diabetes) can cause widespread and serious cell dehydration throughout the body. In addition to this direct dehydrating effect of excessive glucose, the loss of glucose in the urine causes a condition known as osmotic diuresis. In osmotic diuresis, the high level of glucose in the renal tubules of the kidney has the effect of attracting water, so as to dilute the concentration. Unfortunately this means that less water is reabsorbed by the kidneys, and while the amount of urine produced increases, the amount of water left in the body decreases, thus leading to serious dehydration. Dehydration, excessive urine production and excessive thirst are three of the most common symptoms of untreated or badly managed diabetes. Severe dehydration can go on to cause major problems within many of the body’s major organs. When blood glucose is poorly managed over long periods of time, the blood vessels in multiple tissues throughout the body start to show abnormal functioning and can even undergo structural changes. These changes often result in an inadequate blood supply reaching the tissue, and depending on which type of tissue is affected can lead to heart attack, stroke, d-stage kidney disease, retinopathy, blindness, ischemia and occasionally gangrene of the limbs. Other complications can involve the peripheral nerves and the autonomic nervous system which can result in heart arrhythmia, impaired bladder control, decreased sensation in the extremities i.e. hands and feet and a number of other symptoms associated with peripheral nerve damage. There are various secondary illnesses that are commonly linked with diabetes such as hypertension and atherosclerosis, and when diabetes is poorly managed, these secondary illnesses can severely amplify the tissue damage caused by the elevated glucose levels. Sufferers of diabetes mellitus metabolise fats in preference to carbohydrates and this results in the release of high levels of keto acids. These are normally taken up and used by the tissue cells but because of the increased amounts being produced the cells can’t use them up quick enough, thus they accumulate in the blood plasma. This excess of keto acids leads to metabolic acidosis, which, if combined with dehydration due to excessive urine production (in turn due to bad management of diabetes) can quickly result in severe acidosis and even diabetic coma. 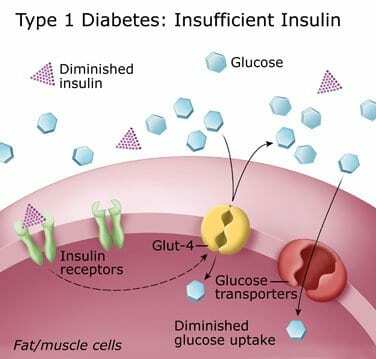 Because diabetics can not utilize glucose for energy, their bodies use stored fats and proteins. Therefore a person with severe untreated or very badly managed diabetes can suffer from rapid weight loss and asthenia (lack of energy) even though they eat huge amounts of food. Without treatment these abnormalities can cause severe wasting of the body tissues and death within 2-4 weeks. The correct management of diabetes is essential for a healthy life and if things are allowed to slip, a whole range of complications can arise, some of which are not reversible and may even result in a truly life threatening condition.